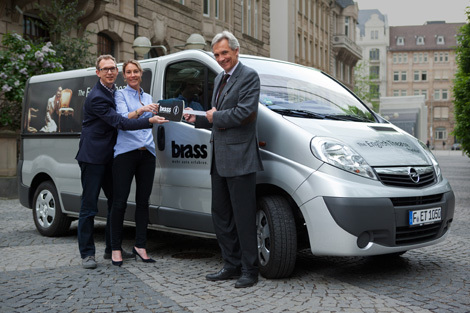 Opel Brass sponsors an Opel Vivaro for day-to-day theatre work. 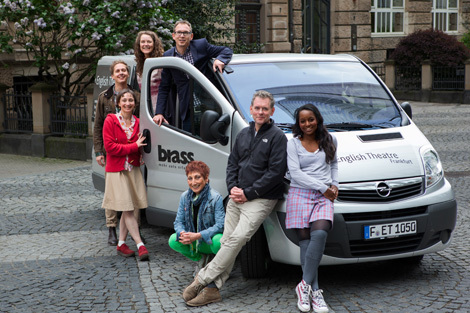 The English Theatre Frankfurt Team is very happy to announce that we are now the proud owners of a “Theatre-Car“ – an Opel Vivaro. For many years we have been looking forward to this. Having this nine seater means that we are now not only able to give our actors an even warmer welcome by picking them up from the airport, but additionally it can be converted into a van. This means we can also pick up props and transport set elements to the theatre or equipment to out of house events, such as the annual Museumsufer Fest. Very special thanks go out to Ulrich Brass and his company, who sponsored the ETF’s Theatre-Car. For this we are very grateful. Ulrich Brass, managing director of Opel BRASS hands over the sponsored theatre car to Jantien Bierich (Fundraising ETF) and Daniel Nicolai.